dStors.com is the next generation, open source, peer-to-peer social marketplace that aims to be a part of the global sharing economy. Got stuff you no longer need? Give it away to someone that does! Are you a musician, artist or an existing business owner and want to take your business online? Do it with dStors for free! Just getting started or an already established eBay/Amazon seller/buyer and are looking to accept/spend crypto as a form of payment? That's the spirit! Not only will you be able to open your own store with dStors and start selling your merch and services right away, but we also want to give you a way to declutter, recycle and reuse your possessions from around the house by enabling you to post auction-style ads/listings in exchange for valuable, digital currency called STORS. You can then use the STORS currency to bid on and get items of value for yourself! The service platform is currently in development, being built on and is powered by the steem blockchain technology; so things like item listing, seller/giver reputation, bids and escrow purchases are all secure, fast, transparent, and easy to do. Centralized ecommerce platforms give you little freedom to run your store the way you want. You're overpaying for everything you do. Used goods can be difficult to price and extract precise value out of. dStors and our native currency STORS is the remedy to these problems! Statistically, most people in the U.S. alone have over $4000 of unused goods in their homes. Unless an item is worth a lot of money, there's almost no incentive to bother listing such items for sale. 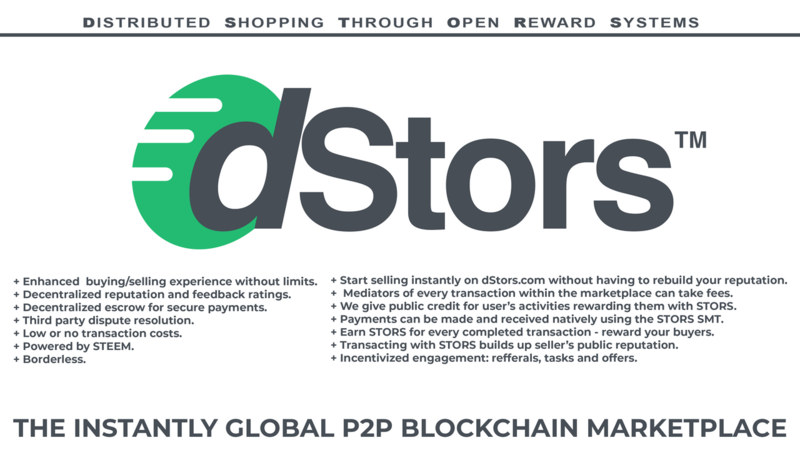 With dStors, our system will incentivize people to start selling these types of items by enabling buyers and sellers to participate in a global peer-to-peer digital market space that will free, fun, easy, and most importantly: highly rewarding to use! Earning STORS cryptocurrency will be the new way to extract value out of the stuff you no longer need by selling it or giving it away to those that do. You don't have to spend money to discover and enjoy the things that you love! On top of it all - you're free to sell what you want and how you want with little to no fees and have a wide range of payment options available to suit your needs as a modern merchant. Another one of the advantages of building this platform on the steem blockchain is that we're instantly global! Anyone who attempts to create a centralized marketplace has to wade through the local laws and banking regulations for each and every jurisdiction in the world where they wish to operate. With dStors - you will be in full control. There is no middle man. No one is going to tell you how to run your business and what you can or can't do. Post an ad/item: you simply post an auction-style listing of an item you're willing to give away/sell and watch the bidders come in! They bid with STORS digital currency that can be earned in various ways: by selling, buying, commenting, tweeting, completing surveys, watching ads, and using other gamified features of dStors to name a few. When the 7 day auction timer runs out - the highest bidder gets the item. You can arrange methods of delivery by directly communicating with the buyer/seller through an encrypted private chat that is built into your profile's dashboard. You will be notified by email about any new replies. Bidders will also have an option to buy the desired item directly using additional payment methods such as STEEM for highly secure, instant, 0-fee transactions, paypal and others. Find an item: you can simply browse the many product categories found on dStors.com and see what people are trading or search for an item that interests you directly. You can private-message the seller or leave a comment on the listing to get in touch with them and negotiate methods of delivery, meeting in person locally, or anything in between. For maximum security, try to schedule a personal/local collection of the item, especially if paying with cash-only arrangement. You will have options. We look forward to experiencing it together with you! Barely any, if at all. Most other marketplaces require that you pay anywhere from 7% to 20% in fees. A portion of those fees are collected as profit for those marketplaces, but the majority of it goes to cover processing fees related to credit cards, banks, fraud, escrow, chargebacks and the list with middlemen goes on. Because dStors is using the STEEM blockchain to process transactions, we can allow our users to trade without extra fees creating even more value as part of the experience. For lower-priced items, it is especially crucial to have little to no fees, as the incentive to sell in the first place would be completely eliminated. Fast, easy and free is the right way to be! If you have delegated to dStors, thank you. You may have noticed that the account has been upvoting your content at 10-20X the value of your delegation. Please understand that one of the unique features of the steem blockchain is the ability to distribute cryptocurrency. As Ned said during SteemFest, this distribution aspect allows small startups and dev teams to leverage the blockchain to sustain their projects. By delegating to dStors you give us the ability to pay costs involved such as server fees, contributor's rewards, etc. You agree to support the project and that's awesome! If you do not see or agree with this, please remove your delegations now. 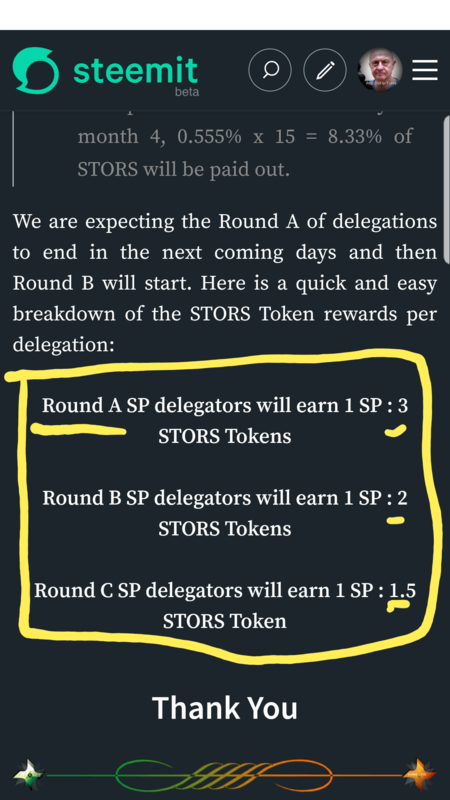 If you choose remain a delegator, you will be receiving 5 STORS SMT tokens per SP delegated (upon SMT protocol release, immediately to your SMT wallets). In return, dStors will use your delegations to support the project, your content and the communities that help us develop it. We will be using services like minnowbooster to sell partial upvotes in order to generate liquid steem that will go to support contributors. This will give us security and confidence and we will not be affected by flags or upvotes. Please try not to upvote our future updates here on our blog. This is the better way for us and we'll issue reports for transparency. 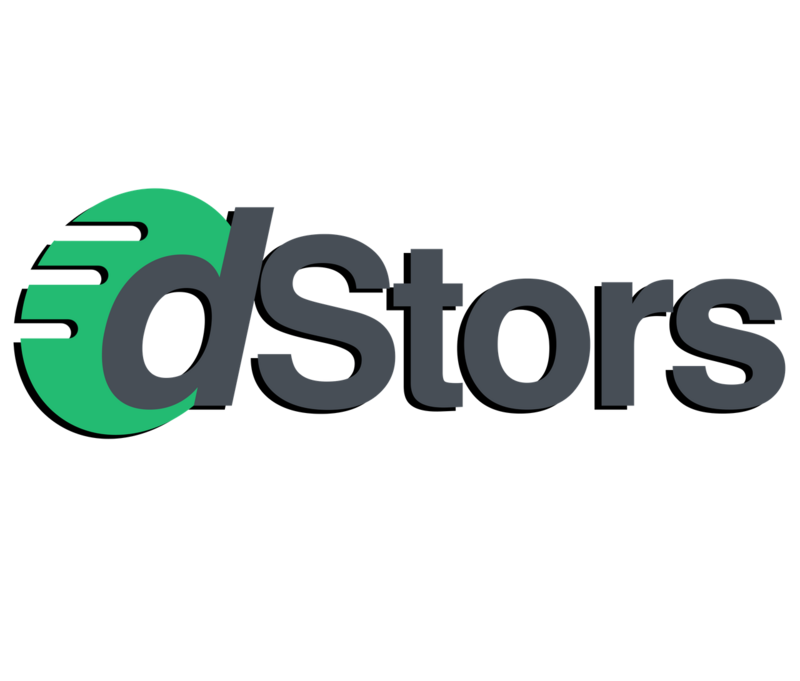 Sign up and open your first store - 100 STORS on the house! List your first item to get 30 STORS. Give away the stuff you no longer need and continue earning STORS every time you list. Use Twitter to show off your latest listing or the stuff that you got from dStors.com and get another 20 STORS! As of right now, there's no concrete deadline as to when the stable dStors.com and mobile app will be released, but it is highly possible that it will happen before Steemit Inc's SMT launch, which will give us a good head start. The native STORS Token, which will have greater value than ever before due to its full native, utility and currency use on dstors.com, will be distributed to all current delegators with the release of SMTs or earlier. We will share our roadmap with you guys when we're ready. Stay tuned. Wait, wait ... maybe I've missed something. This brings some confusion to me. Are all the previuos rules been canceled? Does this x5 multiply applies to only new delegators ? Or the "ROUND A" multiplier has been changed ? There have been some changes, true. But yes, this is for old and new delegators alike. If you choose remain a delegator, you will be receiving 5 STORS SMT tokens per SP delegated (upon SMT protocol release, immediately to your SMT wallets). This sounds good but I have a question. What will the value of the STORS token be? Why would i want to sell something (especially valuables) with a currency that has no value yet? Im not sure how that will work. If you know something that has value, I'd sell it for STEEM or fiat or anything else. But items that are of low value...nobody would want to pay money for them as they are hard to price and agree on, but, people can still be incentivized to exchange stuff with each other while earning the token and then bid with it for items they perceive valuable to them. Getting free stuff essentially. And who knows, in the future, it'd be possible to spend STORS on actual brand new store items as well. This is tokenizing the exchange of goods you already have, rewarding you with SMT for liquidating your stuff by offering it to others. I think it's cool. We'll have to see it action, or experience it I guess, to understand the value. This has just given me an idea as we have been trying to clean out some stuff we no longer want so I may give this a try with a couple of items... I would love to grow my Steem Power bybseeking stuff I no longer use or want! Are you using this delegations to sell votes via smartsteem? This seems like a fantastic project and I like how it is essentially using an SMT to facilitate a way for steemians to barter and exchange unwanted things for stuff they will actually use. I can see this taking off big time, especially if the crypto market turns and people who have left return to steem. I hardly use eBay any more... and the main reason is the fees. I do think the token will need to be listed on some type of exchange very quickly so that a $ value of the dstor token can be used as a way for people to price thier items. Unless it's just going to be an open auction format? I shall be delegating (at least1000 sp) at the end of the week when I get back a delegation that's currently in the process of being returned to me. Dstors is a great project and idea! Well done.